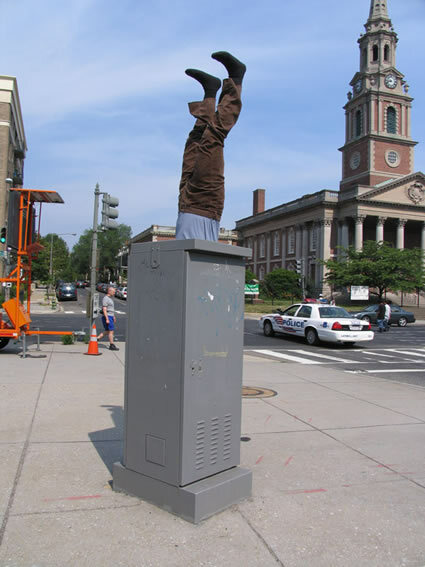 Mark Jenkins is an American artist most widely known for the street installations he creates using packing tape. His work has been featured in various newspapers and magazines including Time Out: New York, The Washington Post, The Independent, the book Hidden Track: How Visual Culture is Going Places, and on the street art blog Wooster Collective. He has shown indoors in galleries in the U.S., Europe and Brazil and is represented by Lazarides Gallery in London. He maintains the Website tapesculpture.org and teaches his tape casting process in workshops in the cities he visits. I like mr Jenkins work it does provoke thought about society in general and that particular location specifically but I have one question; Did Mr Jenkins notify local authorities that he was putting up such emotionally charged work so that tax dollars, euros, pesos, etc weren't wasted responding to murder scenes that were really art? I have seen some of this works, but never had the chance to know who made them! id like to apologize. That comment was incorrect. There is concept and i was confused as to why this was the piece chosen, so i visited your site, and it is veryyy interesting. Magnificent. I apologize and DO appreciate your contribution to the art world. I also advise everyone to look at mark's website. these barely summarize the scope of his work, and there are some extremely interesting pieces. Excellent use of tape. 5 stars!